For the tattoo enthusiast a tattoo is something that describes a certain dominant aspect of that persons personality or character, it is an artistic depiction of the person themselves. Tattoo has been an age old tradition, famous up until the recent years. 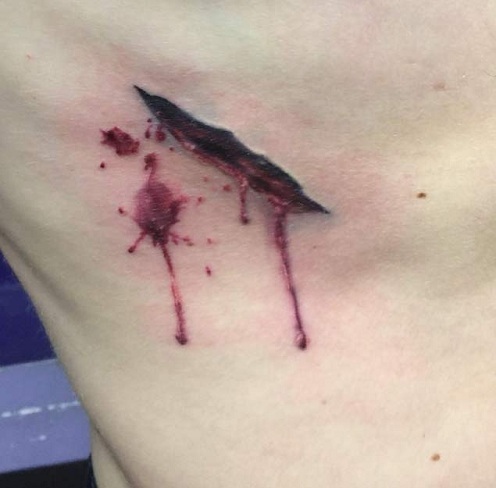 Widely known this tattoo syndrome has different ways of communicating with people. Being a Christian, do you want to display yourself proud? It is possible with Christian tattoos making a statement of your faith and spirituality or in memory of a departed loved one. Using this tattoos, enhance your level of faith displaying it to non-believers that how you are proud of your faith. Therefore Christian tattoo designs are not very uncommon, with the large communities of Christian available all over the world, each rejoicing their religion in their own way. 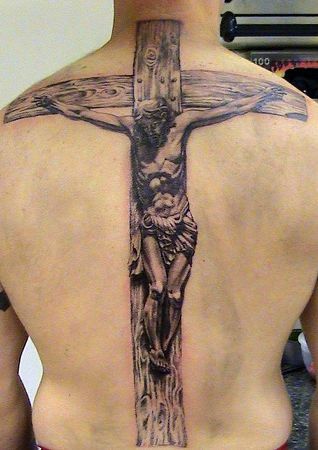 These designs are quite common, for example, the crucified cross is largely a part of the common tattoo designs. 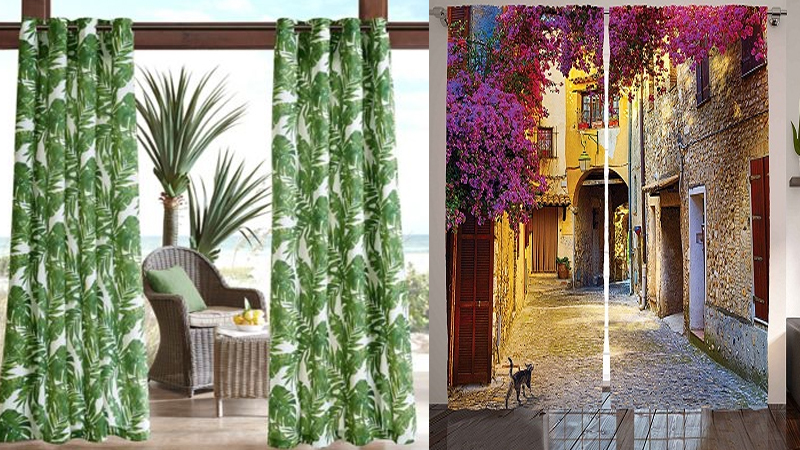 People who choose these designs are normally religious in nature or have a certain tie to the Christian religion. A lot of Christians have already decided to get these tattoos for celebrating their union with God. If you are a person who wants to show that you have given your life to Jesus, then fell in these tattoo ideas of having some cool Christian tattoos that are available in different styles like the tattoos having Praying Hands, Chalices, the Sacred Heart, Angels, Mary, The Apostles and even Jesus himself! You may also get other styles of tattoo like it involves symbols like doves, angels fighting against demons in battle scenes, references to biblical stories, crucifixion scenes and many more. Given below are some of the simple and various tattoo designs that are adopted by Christians with meanings and pictures all around the world. Proverb Tattoo designs is more wisely liked by both men and women. Men’s usually prefer to have a masculine in nature quotes or quotes from how he looks up to. 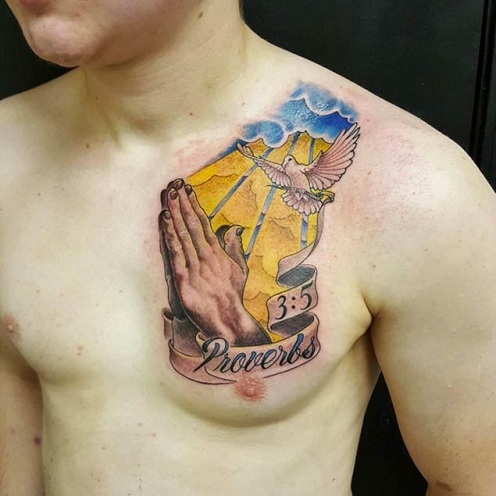 It can be represented as like the quotes that are written in Bible book, and it is having the design with a pigeon bird with praying hands to represent the fact that if anyone is suffering from any problem then definitely they will be saved by the Jesus Christ. Apart from this, there are many designs available on internet and you can get such tattoos by registering through various online sites.It is the best christian tattoos designs. Christians always have a favor of Mary who is holding a baby Jesus. Getting a tattoo of Mary seems to be very pretty and attractive. This tattoo has been very popular since the ancient period and today, Christians were more likely preferred to get this tattoo as this will portray their religious belief to a greater extent. If you want to have this tattoo, try to get it from a tattoo expert who will give a perfect touch to it. If you are not a religious person but would like to have a cross tattoo then you should investigate the tribal crosses and these tattoos do not have a particular religious meaning. Most inspirational quotes will represent the strong and powerful intention of that person. 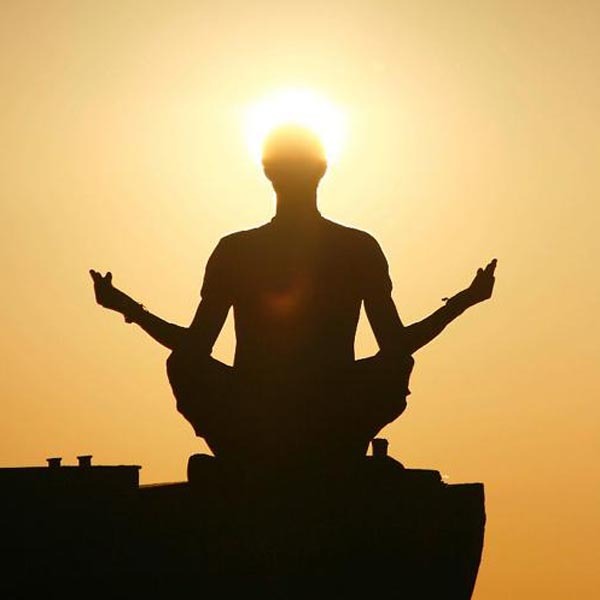 If the inspirational quotes are tattooed in the people body, they will be self-motivated and get self-inspiration to fight against the struggles they are facing with. Through this tattoo, they can overcome all their conflicts and fight opposing for their problems. If the strong quotes are tattooed on your chest, it will give a best impression among others. 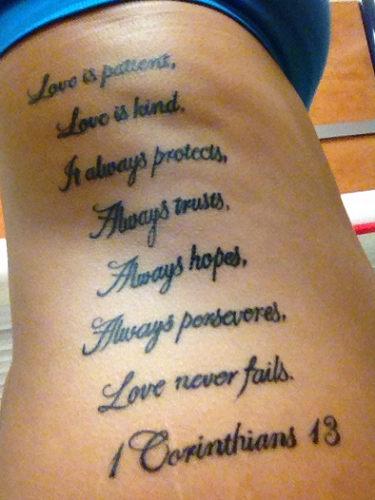 This is one of the best christian tattoo ideas for girls. Tattoos can be done in many colors. Though it can be done in numerous colors and styles, having a Black and grey ink color tattoo will be damn traditional. From the dawn and dusk, people will love to have this black and grey colored tattoo as they will get their ancient heritage concept once if they get tattooed with this design on their body places like upper arms and wrists. 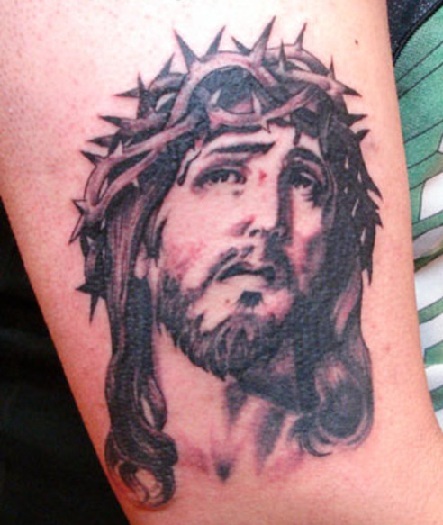 There are many ways available to get different categories of Christian tattoo ideas. Arguably tattoos have never been very popular amongst the more devout Christian community. 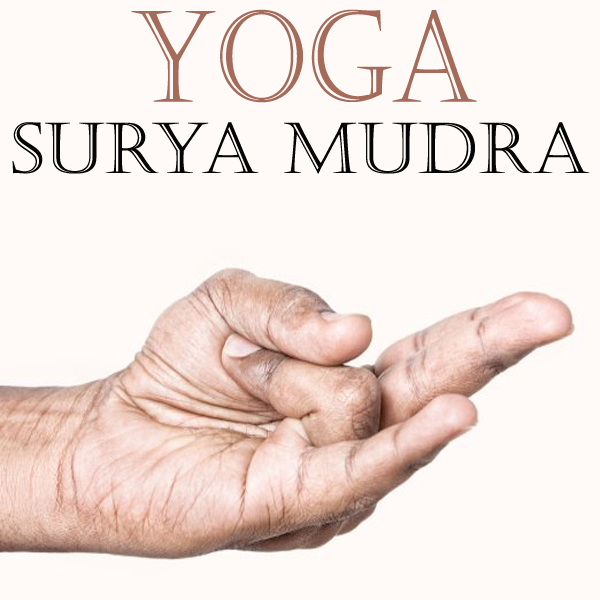 The devout has definitely been looked down upon in the past by the elder folk but with the passing of years people have adopted many new and modern ways of devotion. 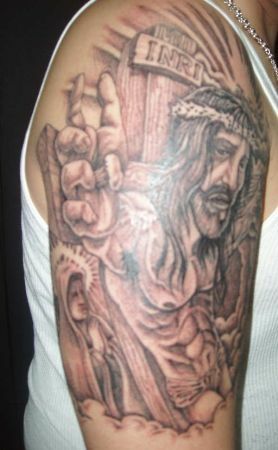 Tattoos are painful to get so people are not just doing it for the fashion they are also doing it as a means of faith. But they selecting the christian tattoo designs to get tattooing. 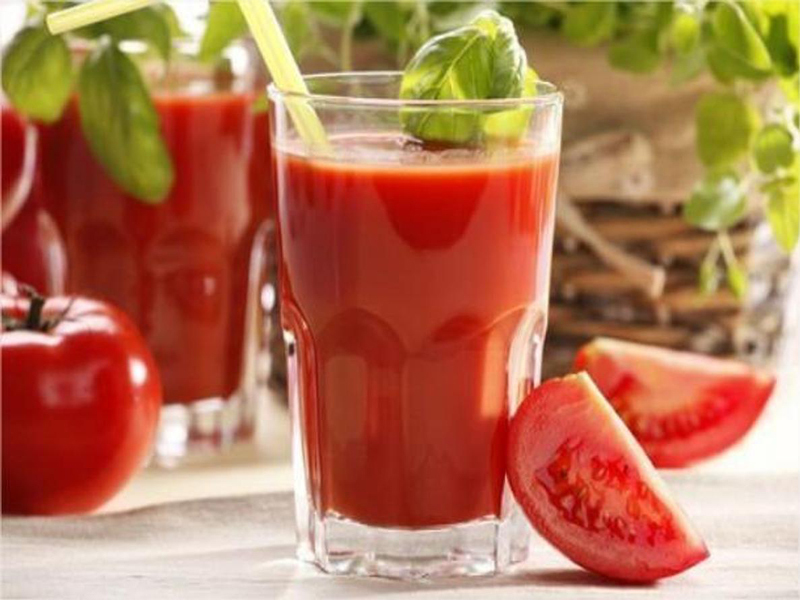 The last supper is notably the most important event in Christian religion and shows how Jesus predicts his own betrayal from his fellow disciple which leads to his death, but since his death cleanses mankind of their sins it is very important. The last supper is a means of worship even today and getting this tattoo is a means of pure devotion. It is the best situation of Jesus life, so people getting these type of christian tattoos on their hands. This tattoo depicts Jesus beckoning you into the kingdom of heaven and as it is said that only the pure of heart are allowed into the kingdom of god that is why one must be of pure faith to really be beckoned by the son of god. A difficult tattoo to complete and needs a sitting of at least 5 hours to complete perfectly. 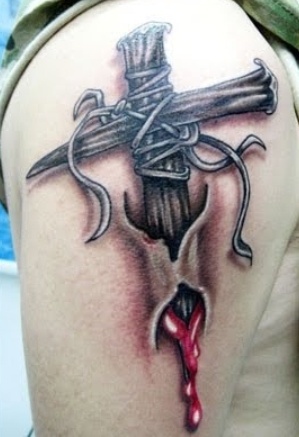 A more modern tattoo, this tattoo embraces a 3d effect where the cross, the most important symbol of christen religion is piercing the skin of the person bonding the individual to the cross permanently. 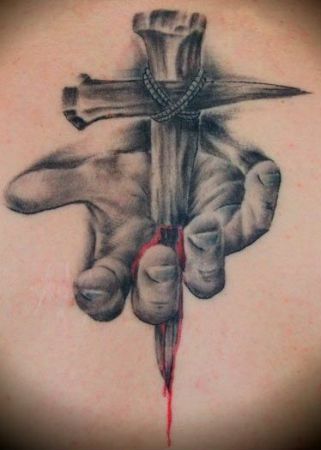 It is one of the best 3d christian tattoos. 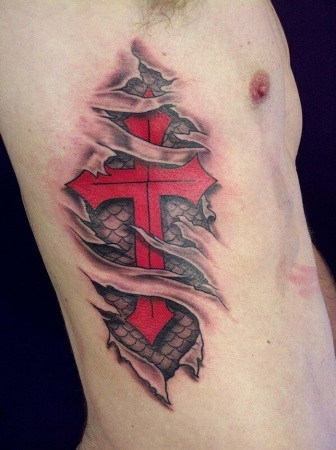 This is another 3D cross christian tattoo design. 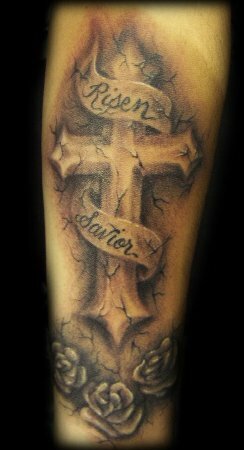 This cross is more new school kind of tattoo that can covers the entire arm or side part body. Quite the vogue today this tattoo is a perfect symbol to the Christian religion. 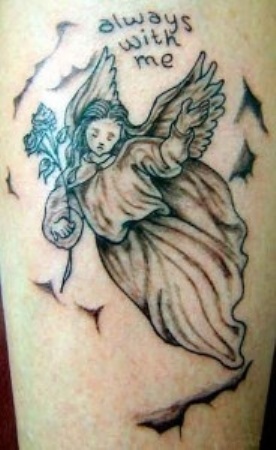 Christian angel tattoo is one of the best on the list of christian tattoo designs. Angels are considered to be the soldiers of god the protectors of truth and innocence and to get a tattoo of an angel is to ask for their protection. There are several hundred angels to choose from so choose wisely. It is the perfect christian tattoo designs for women. A century ago, too many people had a Christian tattoo as these tattoos will frown upon by the Christian clergy, Jewish and Muslim faiths. These tattoos were appreciated and appraised by many Christians as they were having belief that wearing this tattoo will enhance their faith against the non-believers. Consider that if there is a negative thing then there exists a positive thing. It is interesting to note that in the time of the Crusader Knights, some knights will have a small cross in the tattoo that is inked on their hand. 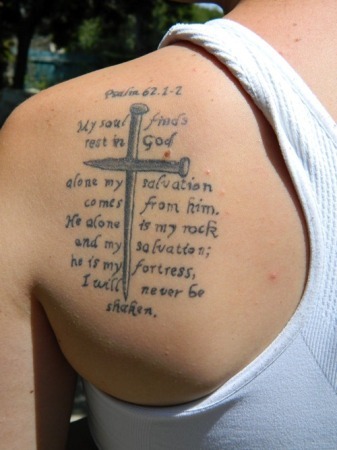 It is one of the best small christian tattoo designs. One of the more difficult tattoo designs this particular design shows the pain that Jesus the son of god went through to save man from sin. The cross piercing the palm symbolizes the nail used to hold Jesus on the cross. It is an extremely symbolic and pious tattoo. The risen savior is arguably one of the most basic but most devout tattoo designs adopted by people conscious about the Christian religion, the unique shading along with the words ‘risen savior’ are notably one of the only tattoos in the world that can speak a thousand words. 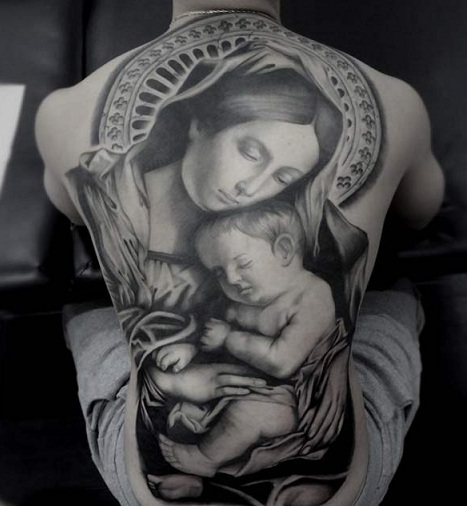 This is one of the most beautiful christian tattoo designs for ever. This tattoo depicts prayer as it includes both the cross and the rosary which is the base for all prayers in the Christian religion. 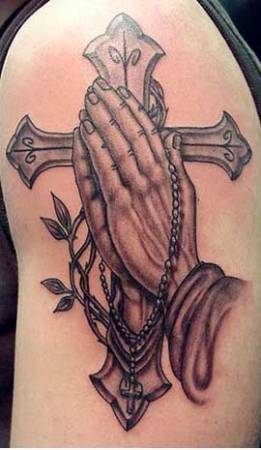 People who have completely devoted themselves to the religion are mostly who get this tattoo. This christian tattoo design is perfectly matched on sleeves. Once if you decide to get a christian tattoo design, it would be wise to research the design of the crosses or other related to christian religion available with a variety of meanings before choosing the perfect one. Images Source: 0, 1, 2, 3, 4, 5, 6, 7, 8, 9, 10, 11, 12, 13, 14.